Proposals can be for site-specific installations and/or pre-existing work. 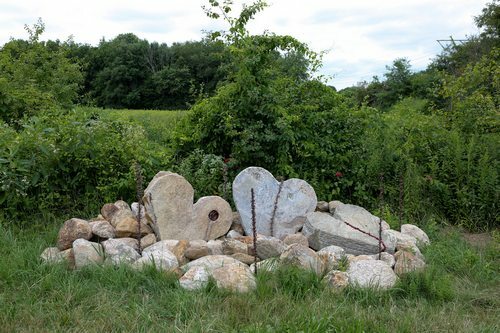 Installations should be sturdy enough to be displayed along the Southborough Open Land Foundation trails from June 12 – September 22. As always, the art must leave no permanent trace to the environment and be installed without harm to surrounding trees or vegetation. Marking Territory explores the idea that both animals and humans have ways of creating boundaries in their environment in an attempt at creating a safe place. Mark making in art refers to the different lines, patterns, and textures we create ​in a piece of art. We invite artists to consider how one might mark the environment in a non-permanent way, as their own expression of boundaries. If you’re feeling inspired, or think you know someone who might be, you can check out the full details here. While organizers hope to schedule some site tours, none are set up at this time. But you are welcome to explore the preserve yourself. Click here for the map.